Did you know National School Lunch Week (NSLW) is just seven weeks away? October 15 will be here before you know it, so how will your school celebrate #NSLW18? 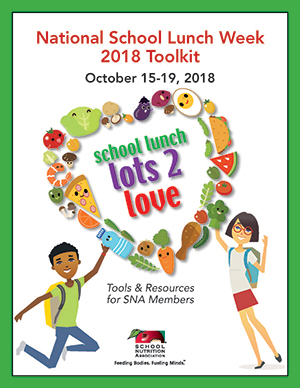 Luckily, SNA is your one-stop-shop for resources and materials to plan your celebration and start getting students and parents excited for lunch week! 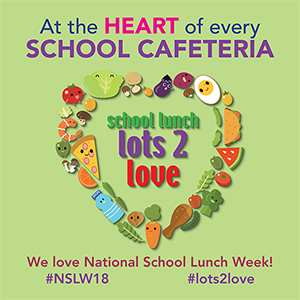 With “Lots 2 Love” as this year’s theme, a fun way to encourage students to share what they love about school lunch is by downloading the NSLW activity sheets and having students work on them with their classmates. Display their artwork for some lovely cafeteria decorations! For lots more resources and ideas to help you plan a successful campaign, download the 14-page NSLW 2018 Toolkit. For best practices and lovely tips on how to share your #NSLW18 celebration on social media, download our social media tips sheet! Also, download our #Lots2Love Facebook cover image and Instagram meme from the Marketing & PR Resources page to share on your district’s social media channels. To use the “Lots 2 Love” artwork and logos, fill out the short online form. Don’t forget to purchase your Lots 2 Love Emporium merchandise early before popular items sell out and to ensure a timely delivery. Orders over $300 placed via phone or fax now through September 10 receive a 5% discount! To place an order for Emporium merchandise, call 1-800-728-0728 between the hours of 8:00 am and 6:00 pm EST Monday through Friday, or fax your order to 443-964-8206. Mention code AUG18 when calling or faxing in your order to get the discount (discount not available online). Download the Emporium catalog to view all the merchandise available and an order form.